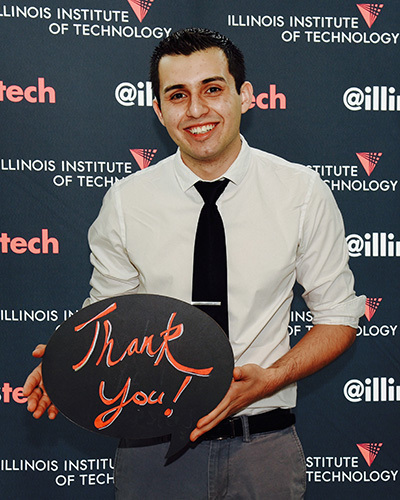 “Receiving this scholarship has truly impacted my life,” says Jorge Acosta (CE ’17), who obtained his Illinois Tech degree this past spring thanks to a Goldstein Engineering Scholarship and is now employed as a software engineer at John Deere. “Without it, my life could have taken a different path.” Acosta grew up in Cicero, Illinois, where his mother, a janitor, struggled to raise four children after his father died. His story is not so unusual at Illinois Tech, which is among the 91 most generous universities in the nation, according to Money magazine. Virtually all full-time undergraduates at Illinois Tech receive scholarships of some kind, but only 5 percent of this money comes from private donations. That is something the university is hoping to change with the launch of its most ambitious scholarship initiative ever, an effort to raise tens of millions of philanthropic dollars for students like Acosta in the coming years. For decades the university has self-funded the majority of its scholarships, hoping that students would reap the rewards. It was a good bet. In 2015 the United States Department of Education released its College Scorecard and revealed that alumni of Illinois Tech are among the highest earners in Illinois and the nation. Further analysis of the College Scorecard by The Equality of Opportunity Project and the New York Times showed that students born to families in the bottom 20 percent of income are more likely to rise to the top at Illinois Tech than they are at any other college or university in Illinois. But ensuring that students from the bottom 20 percent receive the financial aid they need sometimes comes at a great cost to the university. That is why Judson Althoff (ME ’95) recently made one of the first gifts to Illinois Tech’s new scholarship initiative. Today, as executive vice president of worldwide commercial business at Microsoft, Althoff is among Illinois Tech’s most prominent alumni. Yet not so long ago he was a small town Ohio boy struggling to find a path to college. Althoff received a scholarship and now he is paying that gift forward. It is an act of generosity Acosta hopes to imitate. To learn more about scholarships at Illinois Tech, visit https://alumni.iit.edu/scholarship-initiative.